In partnership with The Gotham Center for New York City History and the CUNY Public History Collective, ASHP is hosting a series of public programs titled Difficult Histories/Public Spaces: The Challenge of Monuments in New York City and the Nation. The series brings together historians, art historians, community activists, and artists to discuss the ongoing reevaluation of public monuments and memorials and to engage with audiences about the often controversial histories represented. ASHP held the first event, Monuments as: History / Art / Power on June 13, 2018. The panel presented a case study of the former J. Marion Sims monument on Fifth Avenue and 104th Street, and examined the historical context of Sims’s medical research and experimentation on enslaved women, the modern East Harlem community response to his current memorialization, and future possibilities for remembering this difficult history. The second event, Who Decides? 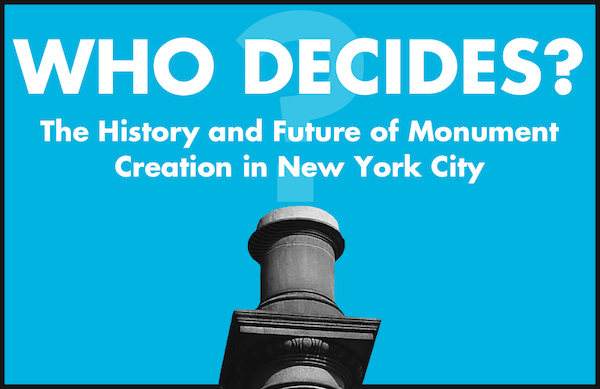 The History and Future of Monument Creation in New York City will be held on October 9, 2018 and will discuss the history of monument creation, visions for new projects, and the current pressures on New York City agencies to respond to public opinion. Participants will include Michele Bogart, author of the new Sculpture in Gotham: Art and Urban Renewal In New York City; Mary Anne Trasciatti, President, "Remember the Triangle Fire Coalition;” Jack Tchen, Professor of Public History and the Humanities, Rutgers University; and will be moderated by Todd Fine, History Doctoral Candidate, CUNY Graduate Center, and advocate of the monument for "Little Syria." A third and final event, focused on alternative approaches to confronting and constructively addressing how difficult histories are memorialized in New York City and throughout the country, will be held on February 6, 2019. Further information will be posted closer to the date of the program. All events are held in the Segal Theatre at the CUNY Graduate Center and are free and open to the public. The series is made possible with funding from Humanities New York and the National Endowment for the Humanities. Visit https://ashp.cuny.edu/difficult-histories-public-spaces-series-public-programs to learn more about the upcoming programs.